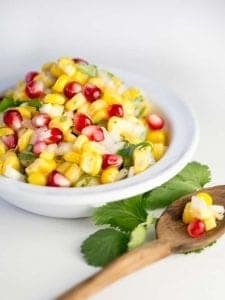 Corn Salad With Cilantro is a quick, colorful salad full of fresh flavors perfect as a side salad, topping on meats or as a dip with chips. This is one of those recipes that I just started creating on what seemed good together and what I had on hand. I needed to zip up our dinner salad, which I had grilled chicken in the works for, using my BBQ Coffee Dry Rub. I planned to cut the cooked chicken into strips for the salad, but I didn’t have any veggies in the fridge to make the salad a complete meal. Then it hit me to make a sweet Corn Salad With Cilantro and pomegranate seeds to compleat our dinner salads. I got high fives from the whole family! There was just something about the sweet dressing, fresh cilantro and tart pomegranate seeds that made it really delicious with our grilled chicken. Here is a bonus, we had some Corn Salad With Cilantro left over so the next day I made my Simple Authentic Mexican Restaurant Style Salsa then added a cup of the leftover corn salad. Another great hit! Had nothing but chips and corn salad salsa for lunch that day!